The first job is to press in the polyurethane bushes. The cast knuckle unit itself is extremely unwieldy and an awkward shape. 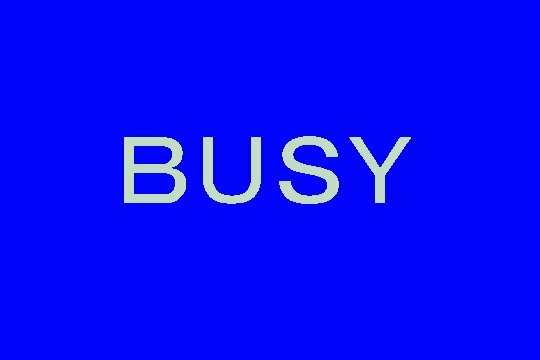 It is difficult to fit in the press for some components and impossible for others. 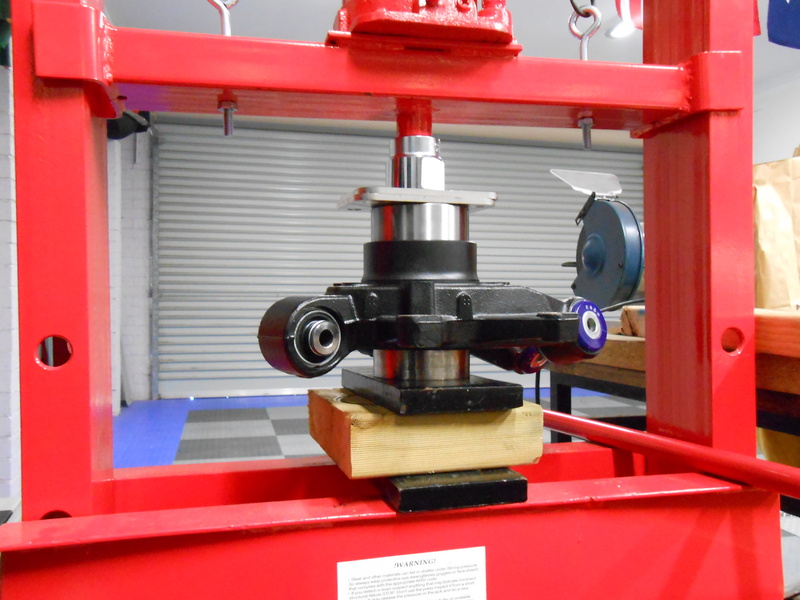 There are 5 pressing operations to be made, for which I used a combination of workshop press, vice, and socket/bolt methods. 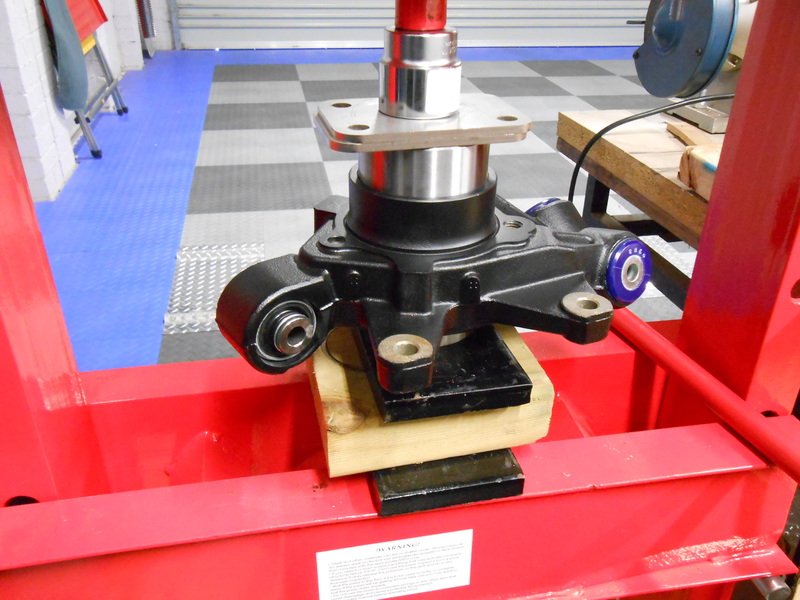 The main drive bearing and drive flange must be installed with a proper press. Once the bush is in, it is greased up and the crush tube can be installed by hand with some force. 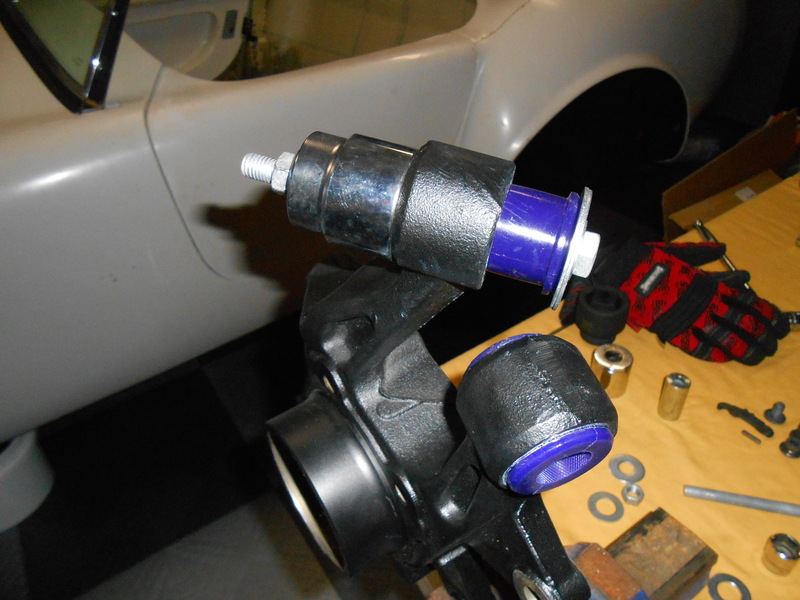 The top suspension A-arm mounts to a heim joint unit which is pressed into the top mounting of the knuckle. This is an awkward piece to install. I started it and seated the first 3mm with the socket/bolt method, and then this is one of the awkward press positions you need to use to drive it home. 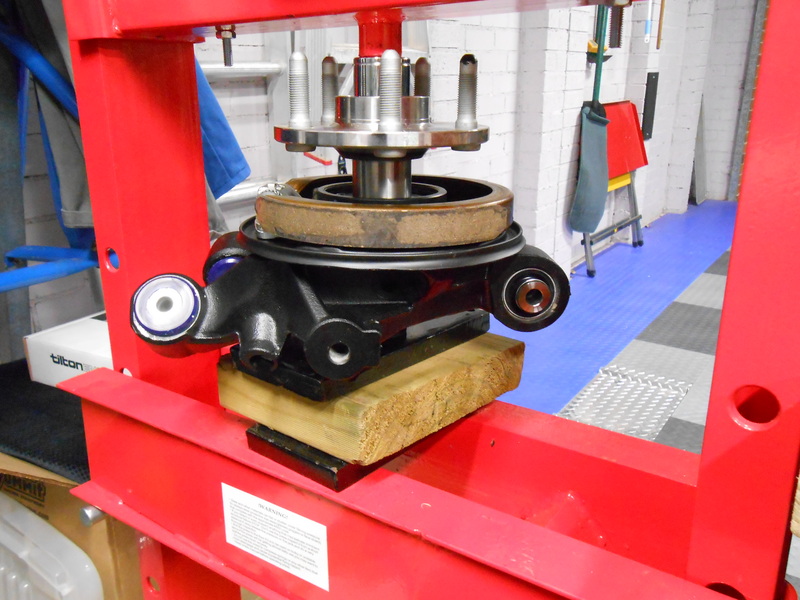 Next up the main drive bearing has to be pressed in. 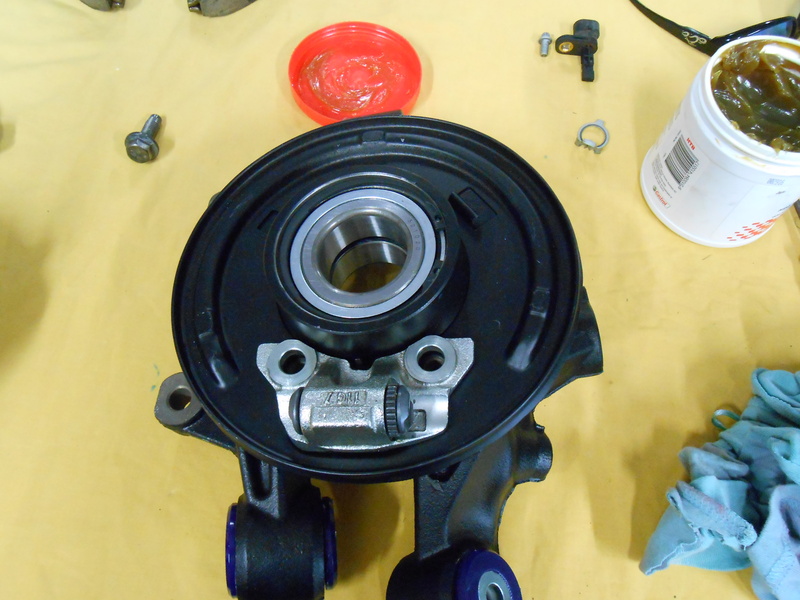 The bearing has the ABS reluctor built-in to the inner race, so the bearing must be installed in the correct direction for the ABS sensor to work. Installing this bearing is fairly straight-forward in the press. To push it home the last few millimetres I took the old bearing housing, ground it down by a few thou on the grinder so it wouldn't get stuck, and used it between the press and the new bearing, this insured I was pushing square on the new bearing and only on the outer race (there is no picture of this step, sorry). 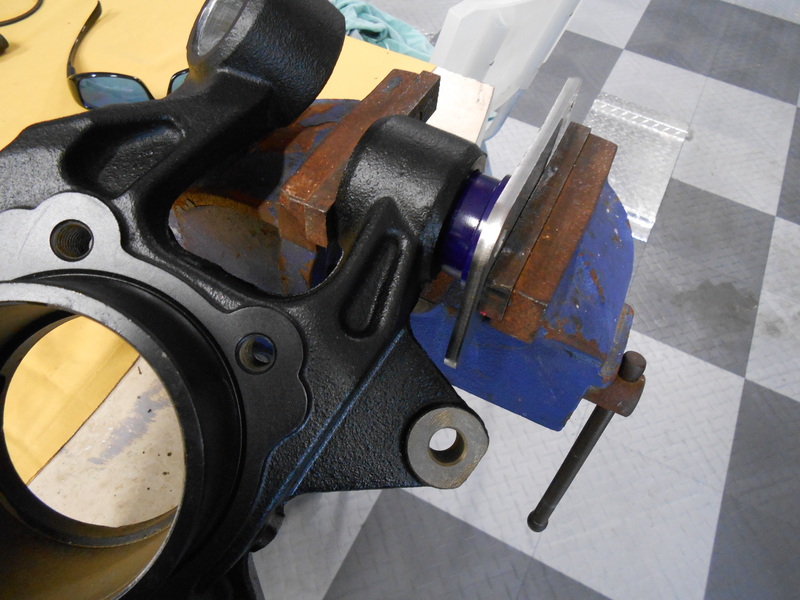 The old bearing also served nicely as a spacer underneath while pressing. 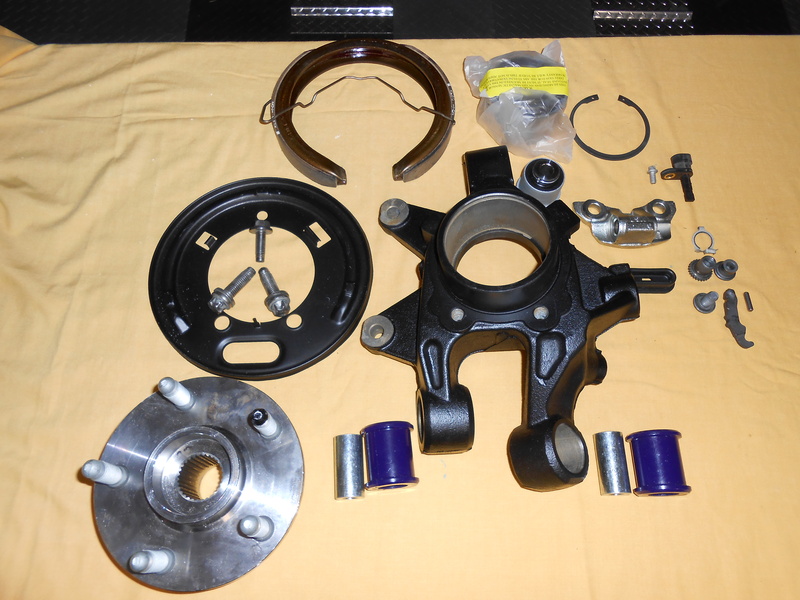 Now the handbrake backing plate and actuation/adjustment mechanism can be greased, assembled, and installed. 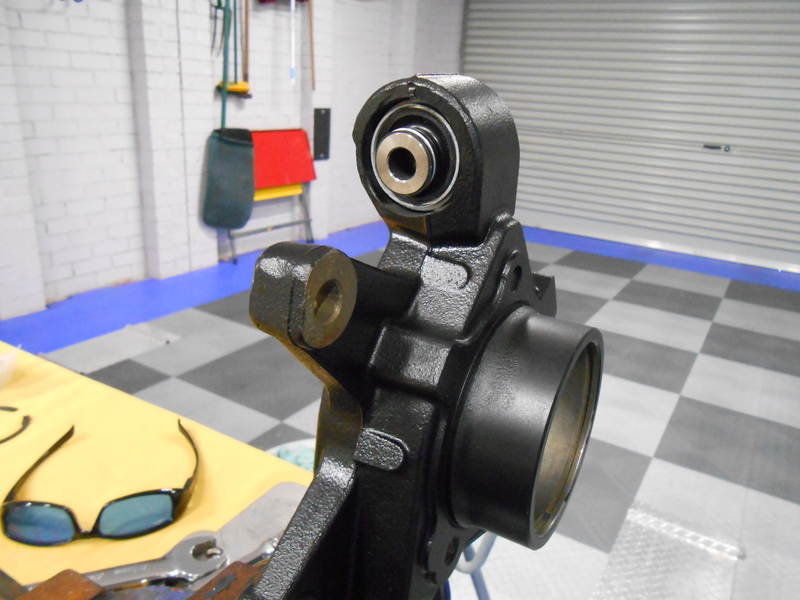 The dumb thing about this knuckle design is that once it is fully together the handbrake mechanism cannot be removed without removing the drive flange, an action which destroys the wheel bearing in the process. 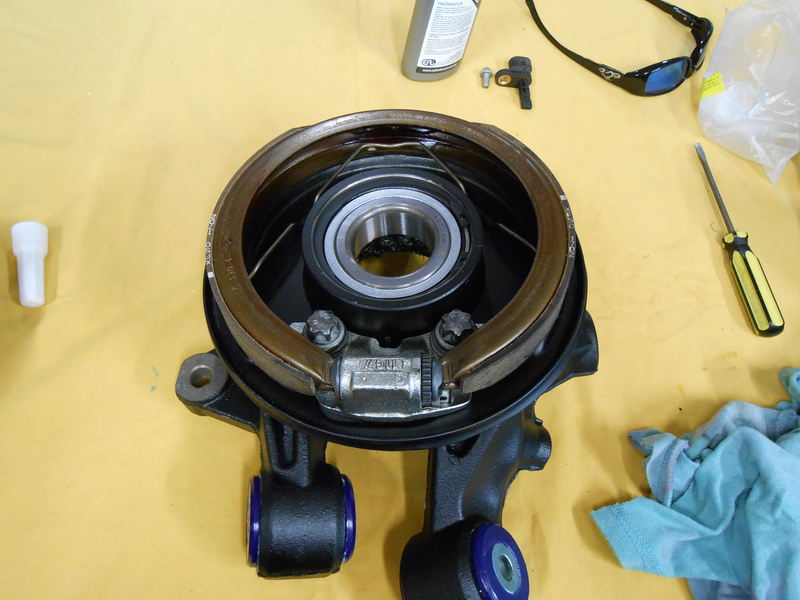 I guess GM thought they could make money out of selling wheel bearings as part of a handbrake rebuild! The two retaining bolts for the actuator housing and the one top bolt on the backing plate all get thread-locker - once it is finished there is no way to tighten them! 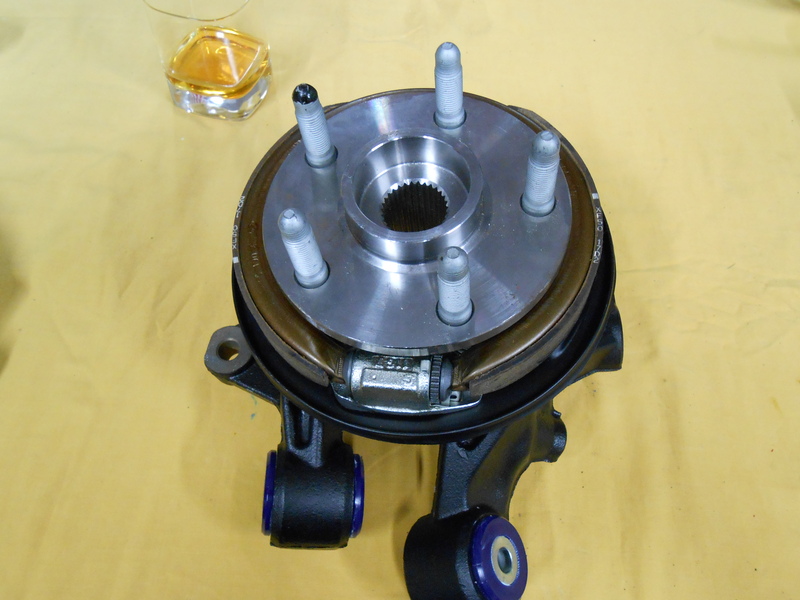 The top bolt is out of view in this photo, directly above the bearing housing just under the middle-top of the handbrake shoe. 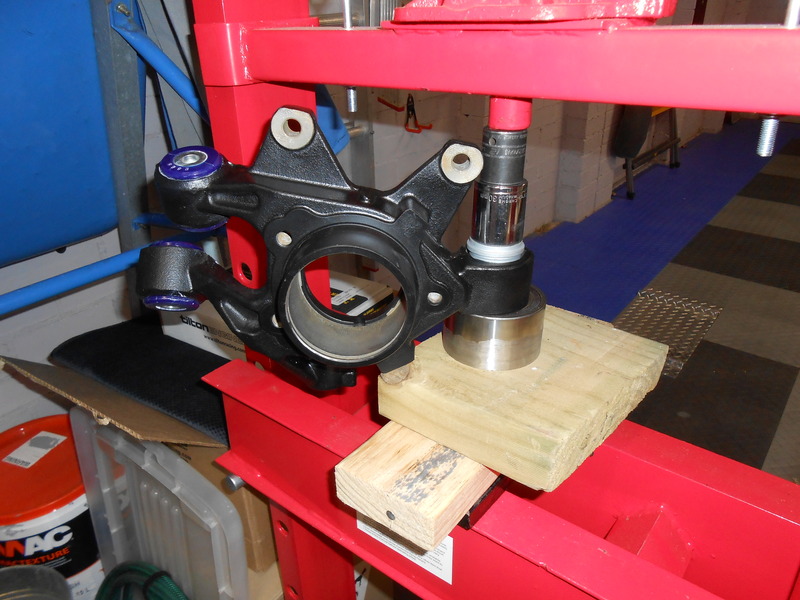 Next the main drive flange is pressed into the bearing. 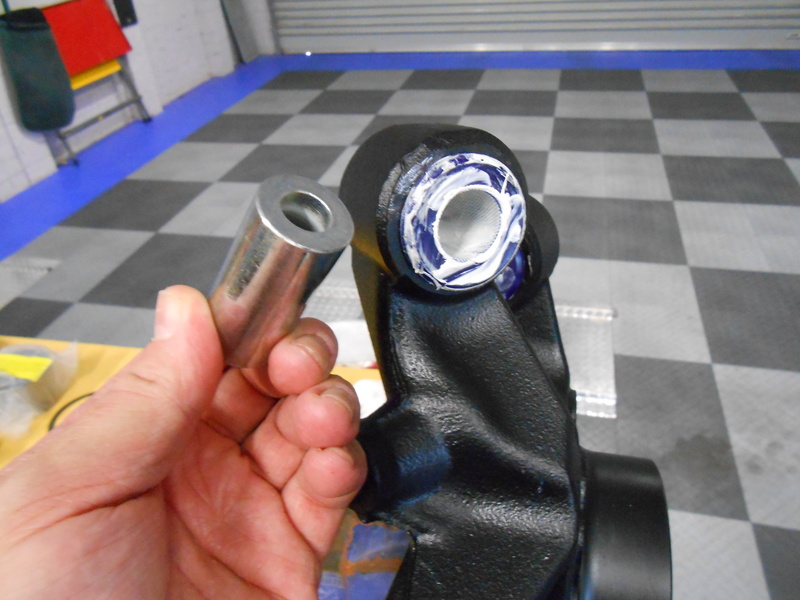 It's important here to have a supporting socket or other suitably sized spacer underneath the knuckle, with the inner bearing race resting on the spacer underneath (I used a large 3/4" drive socket, size-wise it needs to be suporting the inner bearing race). 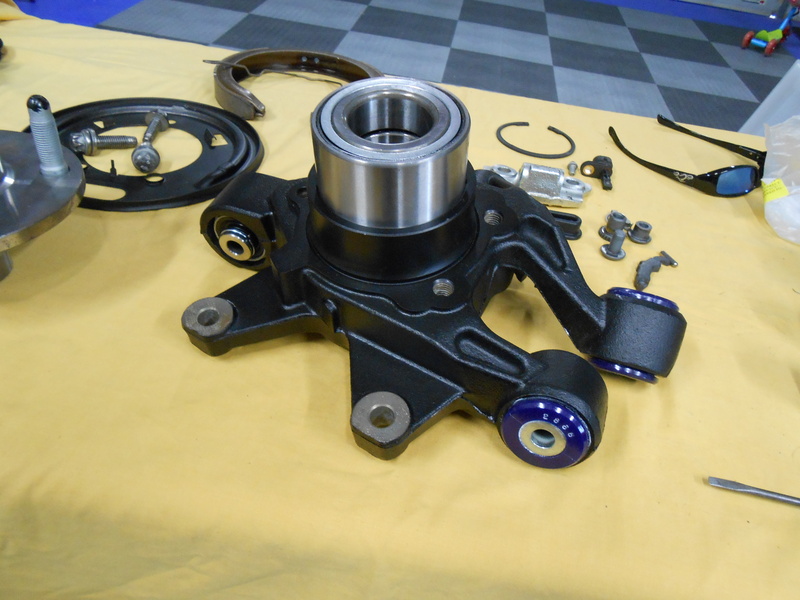 This is because the bearing inner race is actually two pieces, one on each side, which are held in place by the drive flange. 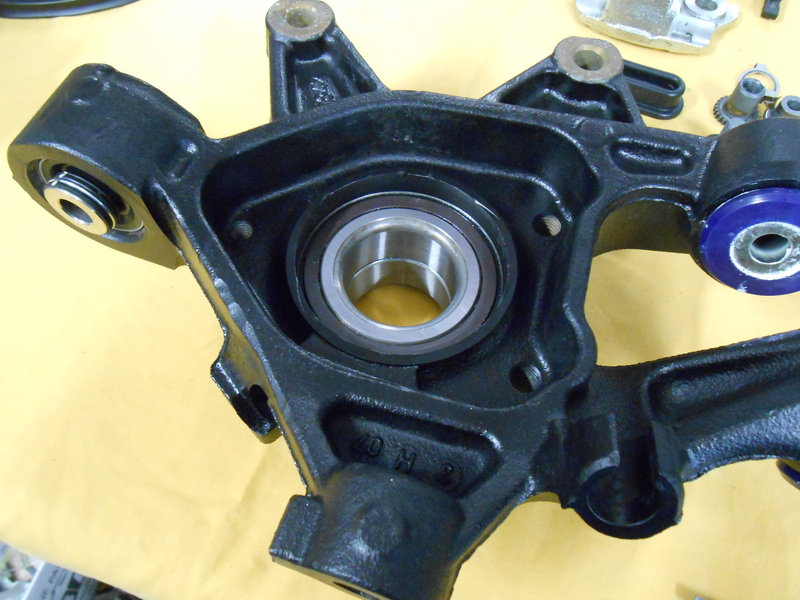 Failure to support it means pressing in the drive flange will sepaate the bearing. 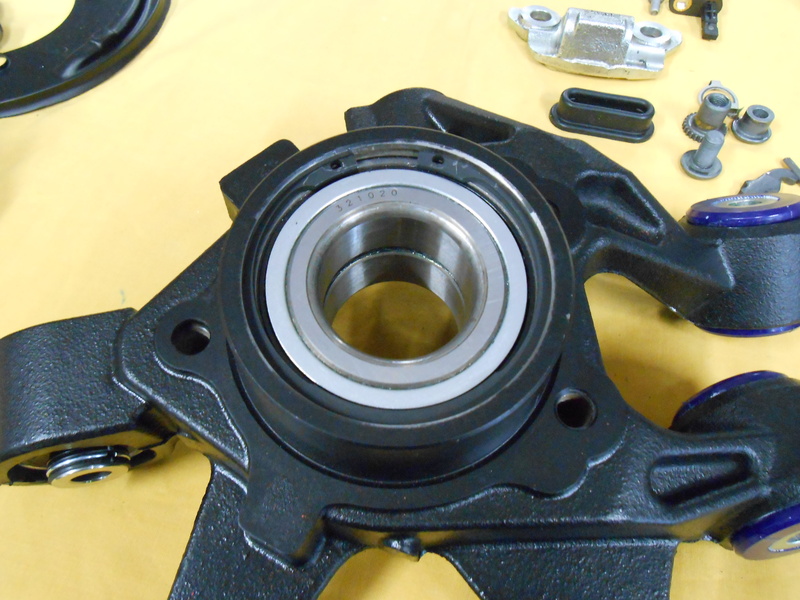 In the end the bearing is held together by the drive flange. 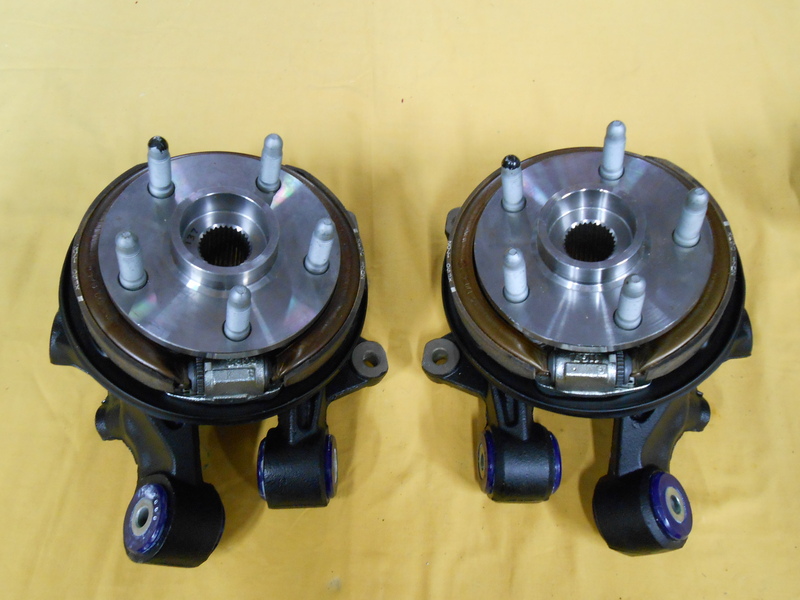 With the lower race supported, pressing in the drive flange forces the bearing together. 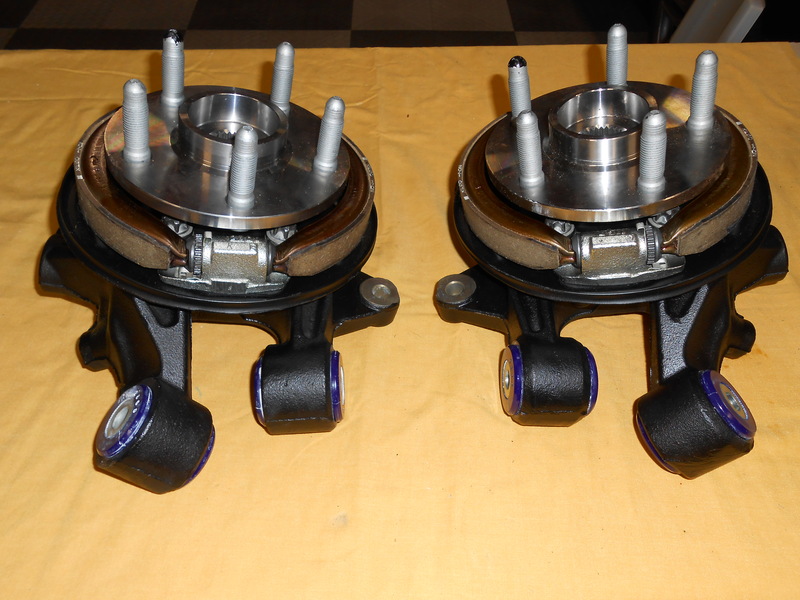 Insert the ABS sensor, thread-lock the retaining bolt, and voila. Finished!